I am happy to announce that my very first task in the Alvastra project is finished! The flint from the Western trench has now been registered and digitalised on the Swedish History Museum’s platform Sök i samlingarna. The total number of flint finds reached 1218 finds in 533 posts. 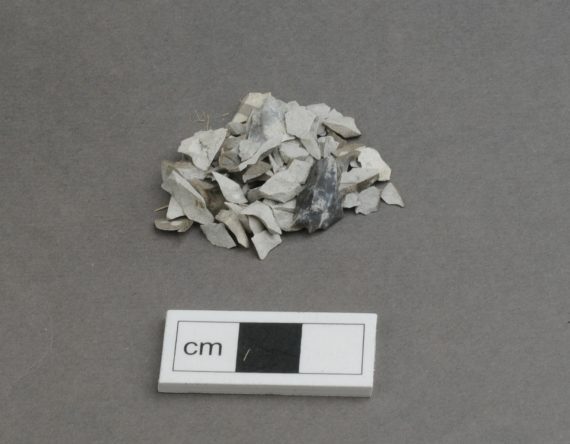 The flint material from this trench is very fragmented, as much as 69% of the flint consists of microflakes (or splitter in Swedish – which are pieces smaller than 10 mm). 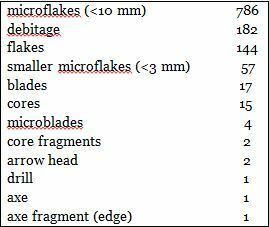 Included in this percentage are also the smaller microflakes (or mikrosplitter in Swedish – which are smaller than 3 mm). All find types from the trench can be seen in the list below. The finds are being registered using the classification system called Göteborgsschemat (Andersson et.al 1978). If you are interested in learning more about this system, let us know in the comments. This could be the subject of another blog post. The flint types present in the Western trench are mainly Senonian and Danian flint, both of which originate in Denmark and Scania. However, the flint is to a large degree burnt which has made it impossible to determine the flint types of 42% of the flint. This is a high amount, indicating that burning was one activity that took place in the trench. One especially interesting feature in the trench is the concentration of flint in the westernmost part of the trench. The square X229/Y407, which is marked in blue in the figure below, contains 397 flint finds. This is far more than any other square in the trench. The flint from this square is especially fragmented with 90% of it being smaller than 10 mm. A large amount of these small remains are also burnt. 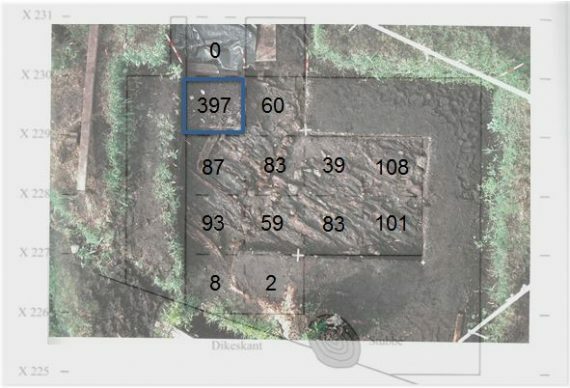 Figure showing the Western trench with coordinates and number of flint finds in each metre square. Especially rich in finds is the square marked in blue. Image is put together out of two photos from Browall (2016, pp. 24 and 35). The large number of flint microflakes in this square is a definite sign that flint knapping has been one activity going on at the site. This can be assumed since these smaller flint fragments are created as by-products during knapping. Whether the microflakes have ended up there during or after knapping is not clear but they are generally not transported over longer distances. Browall has suggested that the microflake concentration is the result of the burning of flint waste, as a symbolic and reoccurring activity (Browall 2016, pp. 85-86). It is also possible, however, that the burning of flint is a practical way of discarding the remains from a flint knapping session. The exact processes resulting in this concentration of flint are difficult for us to determine more than 5000 years after the Alvastra site was in use. Hopefully further registration of the material and future research can provide insight into the different mysteries that Alvastra pile dwelling keeps on presenting. Andersson, S., Rex-Svensson, K., Wigforss, J. 1978. Sorteringsschema för flinta. Särtryck ur Fyndrapporter 1978. Rapporter över Göteborgs Arkeologiska Museiundersökningar. Browall, H. 2016. Alvastra pålbyggnad. 1976-1980 års utgrävningar. Västra schaktet. Kungl. Vitterhets Historie och Antikvitets Akademien. Stockholm.